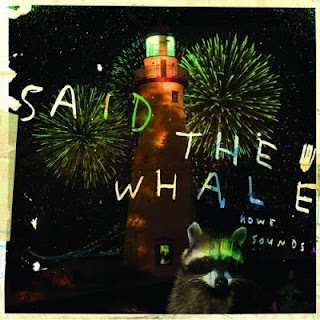 I thought you all deserved a treat, so I have come up with this :) Said the Whale and their album "Howe Sounds/Taking Abalonia" from 2008. This group takes pride in their music and in their country, and in return, Canada takes pride in the group. With a moose and evergreens front and centre on the bands website (www.saidthewhale.com), Canadiana is on display. The music, is no different. Canadian Winter (although most of us had a pretty easy go this year), this is a listen that will bring a smile as big as the sun (in fact listening to the album may be even healthier than a good dose of sunshine, forget vitamin D!). The album uses different sounds, and skipping between genres at points, (including bubblegum folk (”The Light Is You”), thundering hard rock (”Last Tree Standing”) and gentle ukulele ballads (”The Real of It”). It truly is a treat, impossible to tire of, because you're not sure what you will hear next. It makes sense that the band has such diverse talent. Recently during a "twitterview" ;) the band listed Phoenix, Gord Downie, and Jay-Z as artists the group collectively enjoys. Of course the band released "Islands Dissapear" last year, and the hit single "Camilo(The Magician)", which grew the bands fan base even larger. This is also a very good album front to back, but I think fans will agree, listening to "Howe Sounds/Taking Abalonia" makes you like the follow up even more. With the band touring almost non-stop, fans get plenty of chances to see the group perform, and a great mix from recorded albums, as well as songs yet to be recorded. The energy from the songs definitely makes its way to the stage, as the performance is fun to take in, knowing the band likes playing the songs as much as the fans like listening. Perhaps the difficult part for the group now, is whether they can continue to put out top notch albums, one after the other. With so much touring, you wonder how the band has time to write at all. Yet all they do is record great tracks, one after the other. Something tells me that Canada has plenty more to look forward to as "Said the Whale" evolves, let's all enjoy the ride and grow with them.